Make Your Calendars with Pyxis Calendar in Minutes . . .
Calendar Making is so Easy! Choose a static 5 row calendar or dynamically add a sixth row as needed. 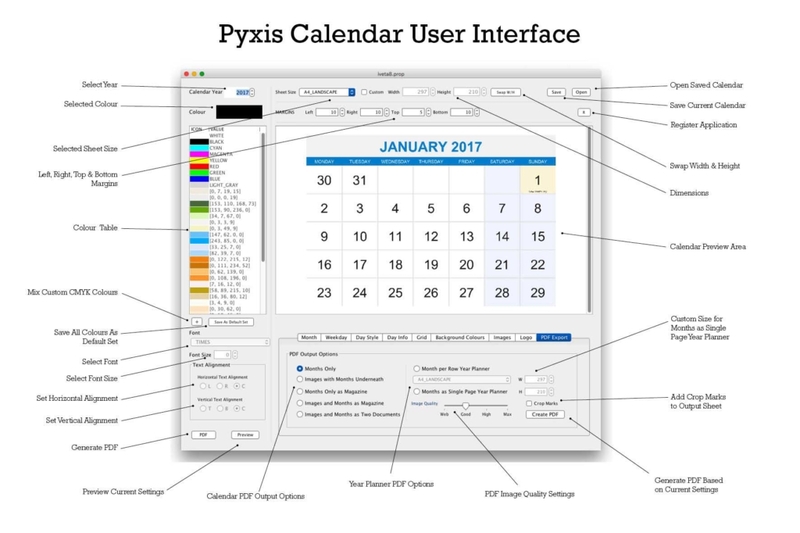 Pyxis Calendar is very easy to use. A complete calendar can be made in minutes. With Pyxis Calendar it is possible to create Calendar Months only, or create a Calendar with images. Images are automatically resized to fit the available space. Calendars can be output in sequential single page format or as an imposed magazine. In addition to calendars, it is also possible to create two types of year planners, rectangular months and single-row months.